Best Outdoor Fireplace Reviews: Top-5 in April 2019! The cold outdoors is sometimes as wonderfully comfortable as the summer heat, maybe even more so. Imagine a cool winters day, snowy fields, clear skies and set in the middle of your patio or yard is a resplendent fire emitting heat in all directions. As the sun sets, the fire grows brighter and the cooler air nips around your ears and nose, you rub your hands together and get closer to the flame. Hot drinks, a barbeque wafting its smokey smells and a warm seat, all set around the amazing outdoor fireplace. You might think that the scene is beyond your reach, or is fit only for expensive homes. You are further away from the truth then you are from owning your own fireplace. In this article, I present you with five exceptionally budget friendly, design beautiful, and efficient heating fireplaces for the outdoors. You don’t need only to own an outdoor grill; you can also own an outdoor fireplace and create that perfect atmosphere of warmth in the coldest of seasons. Outdoor fireplaces and firepits come in a number of styles; they include circular frames with a central bowl, ball-shaped frames, and square frames. They can be modern or rustic and will fit into any architectural style. They also come in various dimensions but usually stay with a 20” to 45” diameter range with knee-level height. The more efficient pits use propane or natural gas, while others will use wood and provide that smoky wooden smell that provides so many memories, although a gas one will be much easier to maintain. Finally, decide on the materials, where construction from good grade metals and fire-resistant ceramics is a must. Remember that the more expensive pits will be made of durable stainless steel and high-grade ceramics, while the cheaper units will be made of rustable iron with limited composites. Then there are copper pits, and ceramic pits, each providing a different degree of compatibility to flame. Whenever you decide to buy a firepit or fireplace, make sure it comes from a reputable fabricator where all the parts are proven to be fire resistant, corrosion resistant, and of strong constriction. Especially the gas appliances that require a good connector. The final consideration is whether you want a firepit cooking unit, where accessories such as grill tops allow you to use the flame for cooking too, or just for heating up a pot of water. When you do decide to buy one, just make sure you get a cover, for when the unit is not in use, and protect it all the year round. Now let’s take a look at the five best outdoor fireplaces. This is the Red Ember 36 in. Clarksville Propane Campfire Fire Pit that looks like a real stone fire pit. The Red Ember 36” diameter x 11” high Clarksville Propane Campfire Fire Pit is made from Envirostone, which is a proprietary mix of marble and resin made to look like real slate style stone. The flame is powered by a 50,000 BTU liquid propane unit, that comes with a variable heat control electronic ignition connected to a liquid propane tank stand and covered in lava rock. What an exceptional product at a fantastic price, well worth the investment, it will not burn a hole in your pocket, only burn a hole in the cold. The GAD860SP Endless Summer Slate and Marble Tile Gas Fire Pit are a square 4,000 BTU propane powered outdoor fireplace. When it comes to design and ambiance, this eclectic and modern design provides an exceptional look and feel to that outdoor fireplace of good quality should deliver. The square steel base with “Italian” design and the ceramic top is perfect for placing mugs of drink alongside and just sitting back to enjoy the warmth of the flame. This model is fired using propane only, and the flame is ignited immediately using the multi-spark electronic ignition, and the flame pit comes with lava rock and logs for ambiance and heating. The heat emanates to 150 feet around the fire. Assembly is required, and some might find it easier to assemble with two participants. However, after you have assembled it, it is of significant weight, and slid construct but is easy to move around in any location you desire. Just take note that the pit when fully assembled does weigh 140 Lbs, and that’s without the 20 lbs., propane tank. This model is 21.7″ x 41.3″ x 41.3”. A rather expensive model, you are paying for solid construction, exceptional design features, and a very efficient multi-spark electronic ignition system. If you want that “rich-villa” look in your yard, this is the one to get. 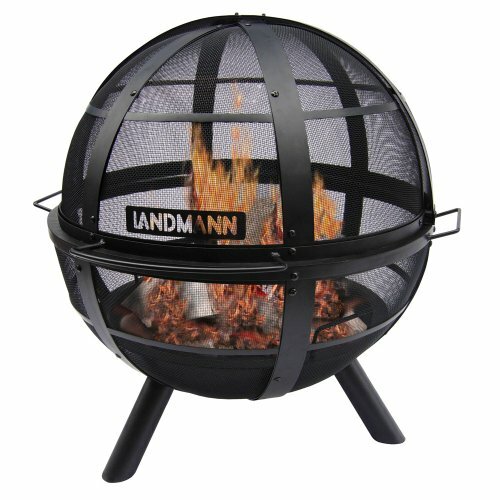 This Landmann USA 28925 Ball of Fire Outdoor Fire pit is unique, its design stands out, and it provides exceptional heat and light for the coldest and darkest of nights. This ball of steel contains a solid burn pit for wood and coal. The fire is covered by a complete ball of steel mesh in a steel frame and closes over the fire; this acts as a spark screen. 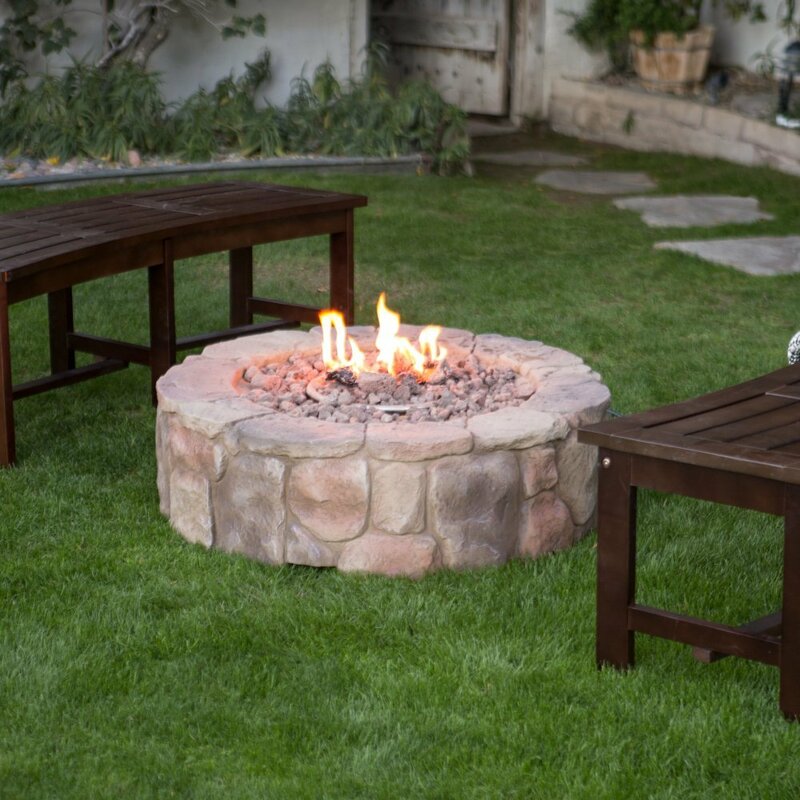 The pros are that this firepit delivers heart and light 360o from its 30” construction. On the downside is that the frame will heat up, and you need to be careful when approaching it. You will need to approach it regularly to maintain the fuel (wood or charcoal/coal). The price is just right, budget-friendly and the design is essentially exceptional, but then beauty is in the eye of the beholder. What you do get is a nicely constructed steel fire bowl for standard wood and charcoal heating, and yes, you can use it to grill on too, but I wouldn’t, it detracts from the overall aesthetic of this amazing device. 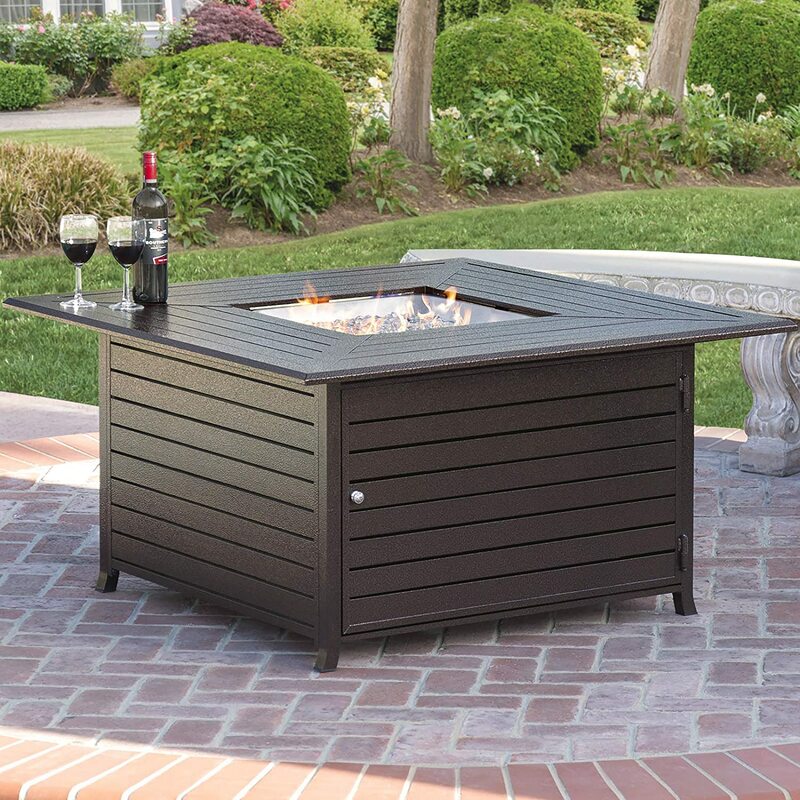 The Best Choice Products BCP Extruded Aluminum Gas Outdoor Fire Pit Table with Cover is a high-end firepit designed for the discerning eye and exclusive owner. 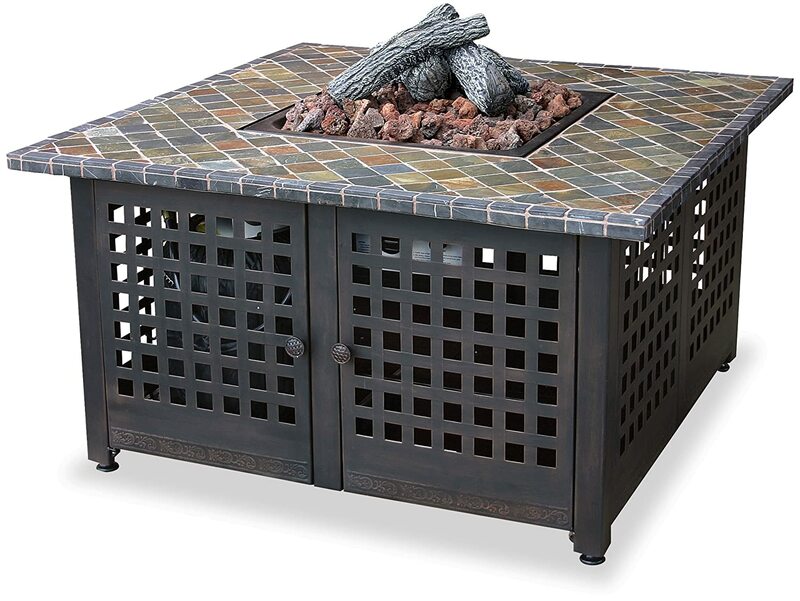 This amazing square shaped firepit sits fabulously in any villa yard, it is crafted from lightweight aluminum alloy and comes with a glass tone filled cast aluminum fire pit. Aluminum does not corrode like iron, is lightweight and is thermally conductive, which means it helps transfer the heat from within. This model uses a 20 lbs., propane tank for power, and outputs 42,000 BTU. The table top and sides are aluminum located with a heat resistant bronze powder paint; this withstands the heat and also helps prevent corrosion as well as keeps the heat at bay, thereby allowing you to place wine glasses on the table side without worries. This model does require construction, and the overall dimensions are 45″(L) x 45″(W) x 23.5″(H), the base dimensions are 33.75″(L)x 33.75″(W), and it only weighs 80 lbs when fully constructed (without the propane tank). This makes it easy to move the pit around, but remain solid enough for a stable stationary performance. Yes, it’s expensive, the most expensive in this review, and its worth it if you can afford it. The design features, the materials, and the output deliver a classic outdoor firepit for any upscale outside patio. The Landmann Grandezza Outdoor Fireplace is a beautifully designed, reminiscent renaissance silhouette of a fireplace and you get all the wonders of a long-lost era warm you up in the comfort of your backyard or patio. The Landmann Grandezza Outdoor Fireplace is a square designed model that provides both exceptional design features with high-performance heating. This is a wood/charcoal burning model, so you don’t have any gas or liquid propane tanks to contend with. This amplifies that old-style heating that was used centuries ago all across Europe. 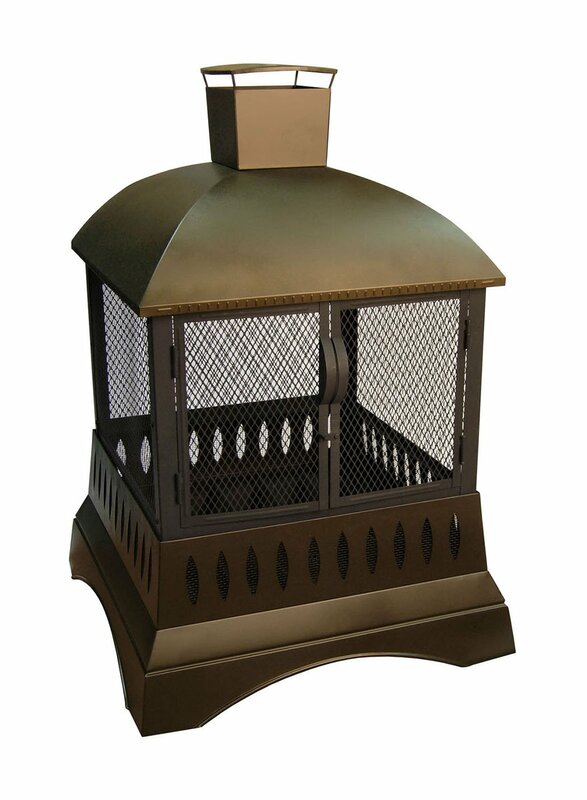 This model provides a 360o light and heat performance and comes with an easy to clean firebase, as well as a large chimney to catch and channel the smoke. The burn surface area is a large 784 square inches and comes with an easy to remove and clean firepan. The material is all stainless steel, and this proves to be extremely anti-corrosive including rust from the rain. The cutout design is extremely decorative, and this models dimension is 33.5″L x 33.5″ W x 50″ H, and it weighs 70 lbs. For extra stability, it is constructed to stand on four solid stainless-steel legs. To assure a safe time, the fire is protected by a spark screen all around and a roof, it comes with a latching door to access the firepan and fire. This is a very decorative fireplace for wood and charcoal, it is aptly priced and provides exceptional performance and durability for all seasons.